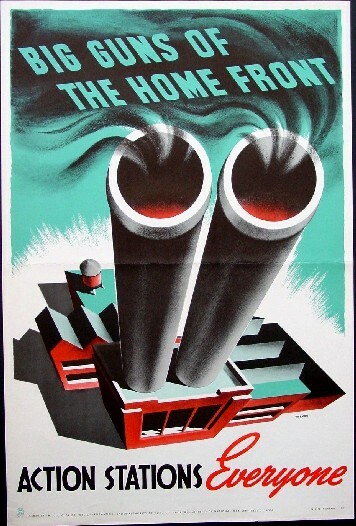 Comments: This spectacular Canadian poster offers one of the most dramatic means of emphasizing the importance of defense industry production to the war effort by viewing two industrial smoke stacks from the top so as to make them look like gigantic guns. One of our personal favorites. Condition: Near mint, unbacked, one horizontal fold and one small repaired edge tear.